Astromania solar filter, 70mm - let you also do astronomy during the day by Astromania at C Starr. MPN: SKU_AM_SF70. Hurry! Limited time offer. Offer valid only while supplies last. The Astromania solar filter comes already assembled in a plastic frame. That means that you will not have to tinker around or construct anything. The Astromania solar filter comes already assembled in a plastic frame. That means that you will not have to tinker around or construct anything. This filter makes it simplicity itself for you to use - just attach it to your telescope and it already fits perfectly. This solar filter is made using a special filter foil that provides you with a neutral white image of the Sun. With a filter factor of 100,000 times, only 0.001% of the sunlight entering the telescope reaches your eye, which means you can always observe the Sun in perfect safety. This filter is fantastic for when you want to observe sunspots and solar flares and also for observing granulation on the surface of the Sun. It is also great for observing solar eclipses - it is breath-taking watching the Moon gradually obscure the Sun's disc.The Sun always shows some exciting detail. Keep a record of the spots and flares with your camera and become a solar photographer. You can also keep track of how an entire sunspot group evolves. Nothing could be easier! Included in delivery is an adhesive foam ring, with which the filter can be reduced to the correct diameter. Attaches directly to your standard telescope,saves time - no tinkering or construction necessary. e.g, suitable for Skywatcher, celestron, Meade, konus, Orion 70/700, 70/900, 70/400 and more. Made using high optical quality Baader Planetarium AstroSolar solar foil (filter factor ND5). The solar filter meets ISO 12312-2: 2015 and Amazon has verified the security. With a filter factor of 100,000 times, only 0.001% of the sunlight entering the telescope reaches your eye, which means you can always observe the Sun in perfect safety. It is also great for observing solar eclipses - it is breath-taking watching the Moon gradually obscure the Sun's disc.The internal diameter is 100.5mm and there is an adhesive foam ring included in delivery, with which the filter can be reduced to the correct diameter. 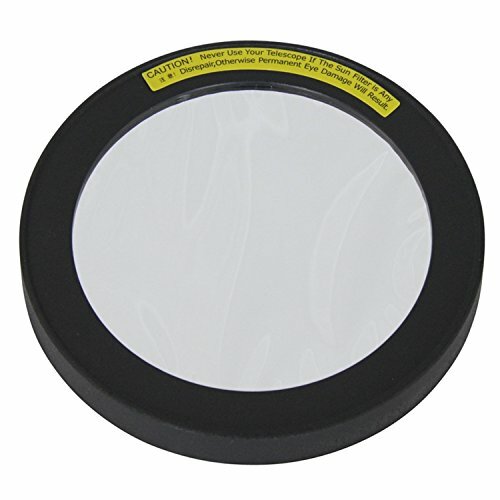 Exact matching plastic frame for many models,inexpensive solar filter,using the 'Telescope front Diameter' column to see which outer diameter you need to have so that the filter will fit on your telescope. If you have any questions about this product by Astromania, contact us by completing and submitting the form below. If you are looking for a specif part number, please include it with your message.